Images have a crucial role in the current contemporary society. Advertising stereotypes are systematically repeated without questioning the consequences thereof. 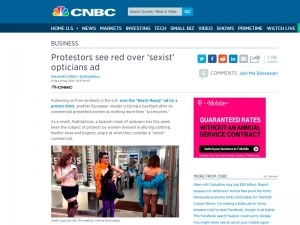 The latest TV commercial for Multiópticas (a well known Spanish brand of glasses) shows a man entering a bar crowded with women in lingerie and a voice suggests “enjoy the amazing feeling of using a new one for the first time, every time you want” https://www.youtube.com/watch?v=l5-IHgkmA0Q (the link is not available because the Autocontrol platform has retired it to consider it degrading, see the resolution below), strengthening through these images stereotyped referents that are often sexist and degrading, such as the ‘it girl’ or women as a sexual commodity. In their ad, Multiópticas establishes an analogy between an object (glasses) and women, turning the latter into an item and characterizing them as “accessible” and “accessory”. Accessible because they are willing and available; accessory because the man can change ‘them’ every time he wants. 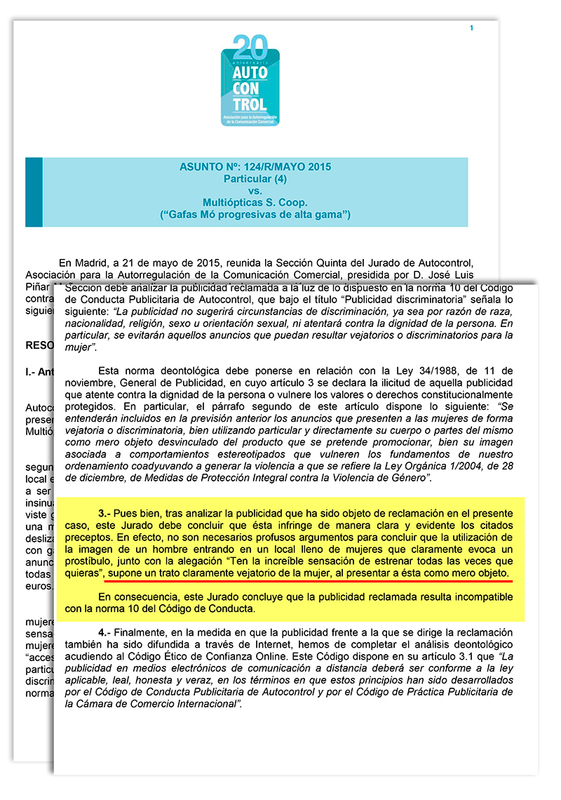 With this action we demand Multiópticas to withdraw the ad that is currently airing on TV and to appeal to publicists in general for an advertising more committed fair values that do not degrade or discriminate anybody. Consumers have the power through our purchases to support or not this type of messages. We can show that not everything goes. For this action I launched a call in my social networks for all women who wanted to participate to show up dressed in the same way as the women in the ad. We met at one of the flagship stores and recreated that image in their own shops. The scene sparked different reactions among the clerks and clients: from those who thought that the girls were sent by Multiópticas for selfpromotion to those who insulted them and even called the police. This action had a great impact in social networks (more than 70.000 likes and 40.000 shares in a few hours) and was shared in national and internacional media and blogs about advertisement. After that Autocontrol platform ordered its removal to consider it degrading.